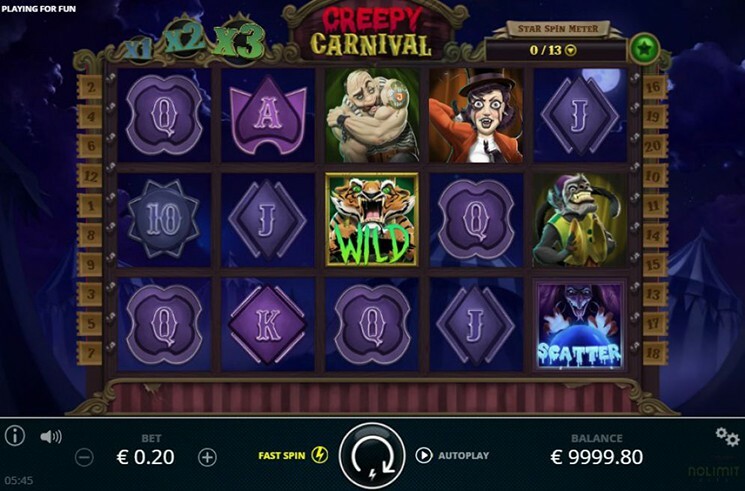 Creepy Carnival is a standart 5 reel and 20 paylines, provided by NoLimit City software. As you already guessed it primary inspiration of the video slot, comes from horror sub genre which is focused on scary clowns and other creepy carnival creatures. Atmosphere, design is dark and colorful at the same time, video slot correctly tranfer that feel. Low paying symbols are our standart playing cards, like 10’s, J’s, Q’s, K’s and A’s. High value symbols are different carnival charaters, such as the bear, the strongest man in the world, a grinning monkey, a terrified lion tamer girl and a scary clown with ginger hair. Before investing real money players can try Creepy Carnival Slot for free, or visit any NoLimit City casino such as: SlotsMillion Casino, VulkanVegas Casino, Videoslots Casino and others to play with real money and win. Before you buy a ticket ot a greatest show, you need to place your wager. By pressing “Bet +/-” button you can choose how much you want to wager. Bet level ranges from $0.20 to $50. With “Autoplay Settings” button you can set up number of spins that will go without interruption, also in “Autoplay Settings” you can restrict the amount of cash you can loss until autoplay stops. Two additional symbols that appear on the reel are Roaring Tiger as a Wild and a Fortuneteller as a Scatter. As usual Wild can be used as substitute to other symbols, except for Scatter. When you hit a winning combo, you will activate re-spin feature. After each spin all winning symbols will stay on the reels, while other symbols will spin again. Feature will end when there are no more wins. Free Spins feature activates when 3 or more Scatter symbols land on the reels. Number of spins you will get depends on the number of Scatter symbols you hit. 3 Scatters will give you 10 free spins, 4 award 15 spins and 5 symbols give you 20 spins. In addition during this feature all paying lines are doubled.